I want to share with you my favorite new rag doll. Yes! It’s the 10th Doctor. I know a bunch of you are Whovians who will appreciate a lot of detail on this project. I’ll do my best. 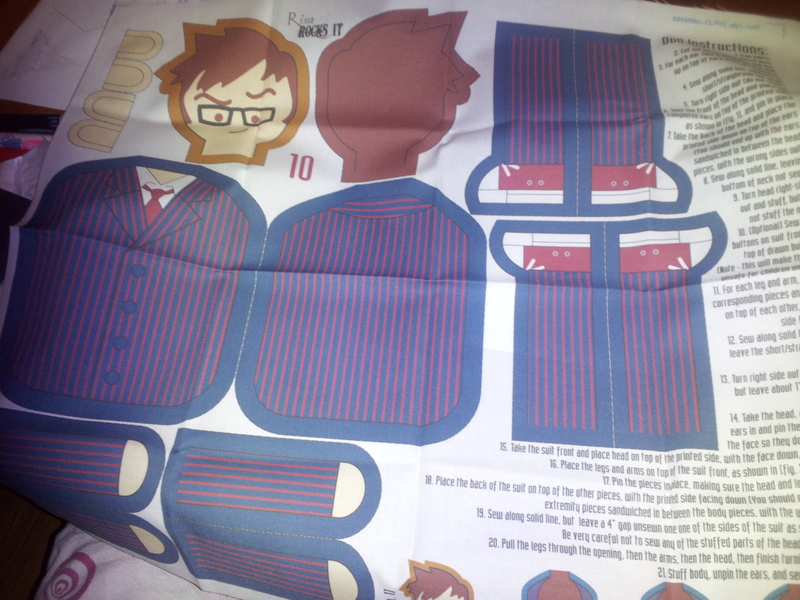 I bought this as a panel from Spoonflower. Find it here. Risarocksit also has a second 10th Doctor if you like his brown suit better. She also has a panel for an 11th Doctor if he’s your fave or you’re trying to start a collection. And, OMG, the Doctor Who finger puppets! Plus, tote bags…yeah, just go give her your money. The panel comes with instructions on it for easy assemble. Just make sure you have enough stuffing so your Doctor isn’t limp. It went together quickly, even with all the basting I did. I do recommend you baste the arms, legs and head down before you put it all together. Also, stitch on the inside of the stitching line so you don’t end up with part of that dark line on the outside of your doll. 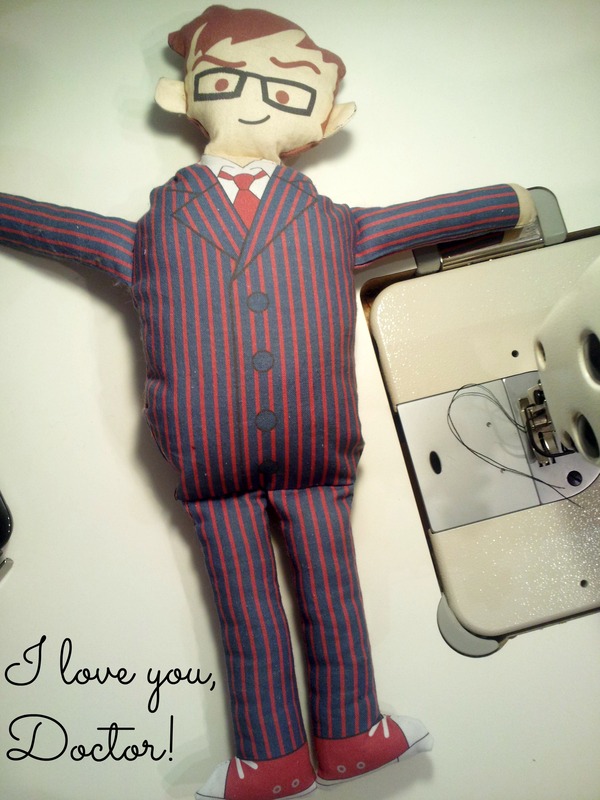 This was my Doctor doll when I was first finished. It was fine but I thought he looked a little boxy and like I had given David Tennant one too many biscuits. Also, the head was super wobbly. I wasn’t about to settle for anything less than what I pictured in my head. Well, actually what I picture in my head ends up with buckets of unrequited love so let’s not go there. Just call me Martha Jones. The instructions said to leave one inch of the neck with no stuffing. What that gave me was a wobbly neck and the more I tucked in the neck to the head, the more my doll started looking freaky. People need necks. I know it’s a rag doll but I still took it apart and added more stuffing to the head and neck and then basted the neck onto the body piece a little more than 1″. It was more like 1.5 inches. Play around to find what works for your doll. I also took him in at the side seams quite a bit, as you can tell from this next photo here. I eyeballed the side seams so that his sides would be in line with the outsides of his legs. His head is still flopsy so if anyone has any thoughts on how to fix that…or maybe I just go back to the fact that he’s a rag doll and rag dolls are flopsy, I’ll live. Has everyone seen the Christmas episode? If you’re curious about how to fall in love with this show, start with the 9th Doctor. Christopher Eccleston’s portrayal of the Doctor is important in understanding where he’s come from and how he eventually evolves with Rose. Plus, you need to lose a Doctor, hate that he’s been replaced and then watch yourself fall in love with the next one. I just started watching two years ago and quickly became a fan. Go indulge yourself in some fan fun. Oh Doctor! Doctor! He is great Leila… Nice work! And ya- he is a rag doll and they are typically floppy! thank you. I love this little guy. 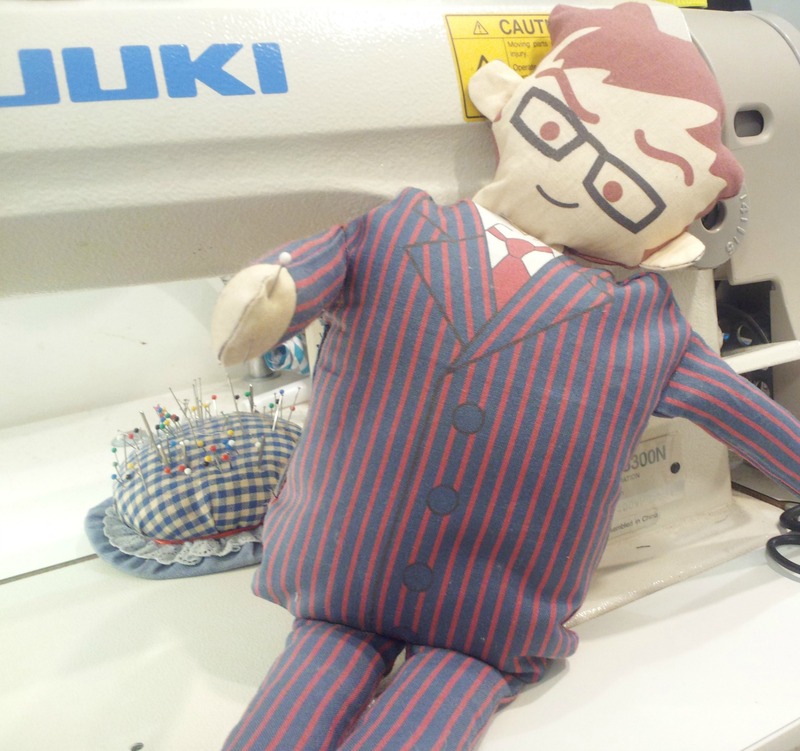 He seems happy in my sewing room, too. I love him! But then the 10th doctor will always be my favorite. yeah, I like the 11th Doctor and man do I love Steve Moffatt (have you seen Coupling?) but Tennant will always be my Doctor. So cute! I got sucked into the Doctor Who thing about a year ago because of Netflix instant. I forget where I am in the series (I need to pick it back up), but I started with the 9th doctor and I’m probably halfway through Dr. 10. Maybe your doll needs a few of the plastic beans you can use in stuffed toys (it’s usually near the polyfil). They might help with the floppy neck. that’s a great idea, Brooke. I know which ones you mean. cool. This is great, Leila! What a cute doll. I’ve been a Whovian since the Tom Baker days. I even made a Weeping Angel for my Christmas tree topper! Oh, Lynn, a Weeping Angel? That’s beyond awesome!! I wish I had been a Whovian longer. Guess all I can do is jump back in that Tardis and make some edits. 🙂 Or, really, I can’t. Cos of the problems it would incur. Thanks for the comment. Good to know who the Who fans are. I started watching the show about two weeks ago. I really loved Christopher Eccleston as the Doctor and was really bummer when he got replaced. But I might even love David Tennant more as the Doctor. I love this ragdoll and if Spoonflower wasn’t as expensive to ship to Belgium I would have ordered everything in the shop! I love Eccleston, too. I’ve loved him as an actor in other things, too. That first loss when Chris leaves is the one that cemented me as a fan. Then, I cried and cried and cried. Amazing how we get so attached to tv characters. Sorry shipping is so much to Belgium. That’s just not right. I just saw Rose ‘die’. Saddest moment ever, I just wanted to hug the doctor and kiss it all better! Oh, I KNOW! I cried like a baby. Still cry every time I watch that episode. that’s so awesome. The Hubbinator isn’t a fan but I can get him to watch an ep or two from time to time. So cute! 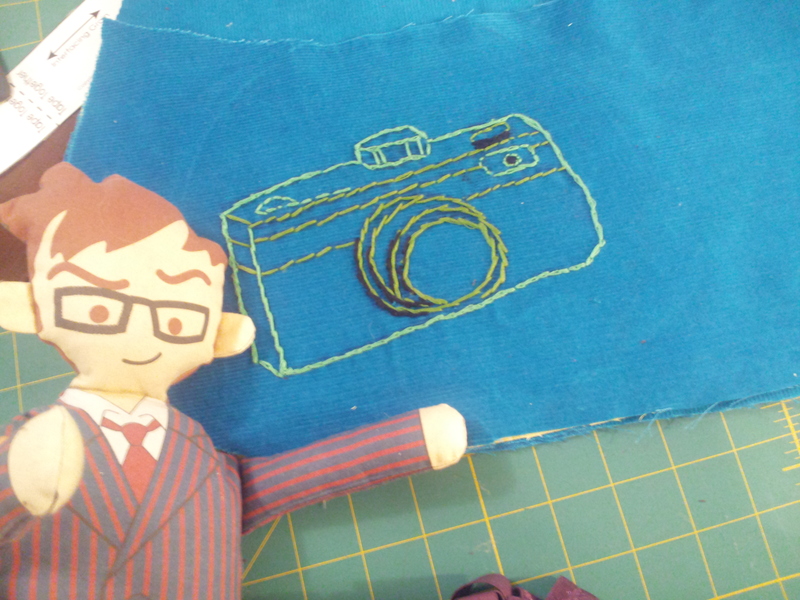 Did you also embroider the camera? I love it. I am a beginner embroiderer (is that a word?) on the side of sewing and am amazed at some of the designs people can create. That’s pretty much what happened to me, too. Chris is so broody and all that but Rose loved him so much and then David’s charm. Oh, his charm on screen. I wish I could see him on stage one day. That would make my millennium. Love him! He’s definitely my favorite Dr. as well. You might try a piece of pipe cleaner shoved through his neck. That would add a bit more stability without more stuffing. Plus you could pose him staring different directions. Oh, wow, posable Doctor doll??!! That’s a great idea. I could have him on my night stand, looking at me longingly.